The Purple Line is a proposed 16-mile Light Rail Transit (LRT) line with 21 stations, connecting Bethesda to New Carrollton. It provides direct connections to the Metrorail Red Line in Bethesda and Silver Spring, the Green Line at College Park, and the Orange Line at New Carrollton. The Purple Line project will be constructed along with three other projects: the Capital Crescent Trail, the Silver Spring Green Trail, and a new entrance to the Bethesda Metrorail station. Learn more on the Maryland Transit Administration’s Purple Line webpage. The MTA Office of Transit Development and Delivery has submitted a Purple Line Mandatory Referral Amendment related to the Purple Line alignment and platform location at the Silver Spring Transit Center Station. This modification to the plan reviewed by the Planning Board on March 20, 2014 involves a change that will result in (1) the Purple Line alignment crossing Colesville Road at a different angle and (2) the placement of the station platform on the north side of the Silver Spring Transit Center (at the third level adjacent to the kiss-and-ride drop-off) instead of the south side nearer to the Metrorail and MARC/CSX tracks located at an elevation approximately 80’ above Colesville Road. There is no change to the Capital Crescent Trail in the vicinity of the Silver Spring Transit Center. This amended plan for the Purple Line alignment and station location at the Silver Spring Transit Center will continue to be refined as Preliminary Design for this change progresses through the balance of this calendar year. The Planning Board is scheduled to review the amended plan at its June 16, 2016 meeting. More information, see the plans on the Planning Department’s web site. Use our interactive map tool to see the Planning Board’s comments on the mandatory referrals. Note: Depictions of alignments for the Purple Line, Bethesda Metro Station South Entrance,Capital Crescent Trail, and Silver Spring Green Trail are approximate. In addition, the Planning Board sent a letter [PDF] to the Montgomery County Council regarding a direct connection between the Purple Line and the Red Line stations in downtown Silver Spring. Learn more about the mandatory referral by reviewing the Submission Documents, including the preliminary engineering plans. 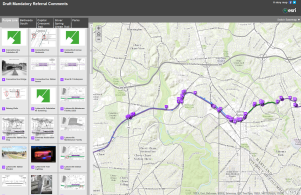 March 20, 2014: The Planning Board reviewed the Purple Line, Bethesda Metro Station South Entrance, Capital Crescent Trail, and Silver Spring Green Trail.